The Williston Basin in North Dakota is proving to be the United States most prolific, homogeneous oil play. Mineral Owners in North Dakota have never seen such a value increase in their mineral rights. The Bakken Shale is projected to be producing over 1,000,000 barrels of oil per day by the end of January 2014. There will be 2,000-3,000 new horizontal wells drilled in North Dakota’s Bakken Shale in 2014. Mineral Owners looking to sell there mineral rights in North Dakota, have never seen a better time to do so. The play is red hot, and the value of mineral rights in North Dakota and the Bakken Shale are sky high. The latest discovery since the Bakken Shale in North Dakota for Mineral Right Owners has been the multiple benches to the Three Forks. This adds even more oil reserves to mineral rights and equates to more money to the mineral owners in North Dakota. Call us today to receive an offer on your Mineral Rights in North Dakota and The Bakken Shale. Mineral owners looking to sell North Dakota mineral rights and royalties, or inquiring to Lease North Dakota mineral rights, please consider 1280 Royalties, LLC. We are a privately held energy company engaged in leasing & acquiring mineral rights & Over Ridding Royalty Interests. We will offer competitive Oil and Gas Leases on your un-leased mineral rights. The Bakken Shale has become one of the United States largest oil field discoveries in the last 50 years. 1280 Royalties, LLC will pay top dollar for mineral rights or Oil and Gas Leases in the following counties in North Dakota: Billings, Burke, Divide, Dunn, McKenzie, Mountrail, Williams & Stark County. 1280 Royalties, LLC is also pursuing the purchase of non-operated working interest in North Dakota. Sell non-operated working interest in North Dakota. There are numerous reasons for selling your mineral rights or royalties in North Dakota. The value of your mineral rights are based on same concept as real estate (Location! Location!Location! ), 1280 Royalties, LLC can help you determine your mineral rights value by reviewing the oil and gas wells in your area. Our engineers and geologists will determine the viability and commerciality of production from your mineral rights. A list of factors will be used in the valuation process. Please call 1280 Royalties, LLC and we can discuss how we will determine the value of your mineral rights. When looking to sell North Dakota mineral rights, 1280 Royalties, LLC will provide you with an estimated value of your mineral rights after a thorough evaluation. We will then be able to give you a price for the mineral rights while helping you in a professional and respectful manner. We understand that a person’s mineral rights are often their most valuable asset besides their home, and we will treat them as such. 1280 Royalties, LLC is pleased to offer a helping hand in buying your mineral rights and royalties. To learn more, request a bid today. Mineral Owners in North Dakota must sign up for the premium services on the NDIC Website in order to view Bakken Well Production and evaluate selling their mineral rights in North Dakota. Mineral Right Owners wanting to find information such as old or new oil and gas leases on their mineral rights, mineral deeds, or other documents of record in North Dakota should also have a subrsciption to the North Dakota Recorders Information Network or (NDRIN). This will allow the mineral owners in North Dakota to see if thier oil and gas lease has been assigned to another company, which companies own the most leases in thier area, etc. Here is a how to video for Mineral Owners in North Dakota to learn to use NDRIN and find the documents they need without going to the courthouse. Sell Mineral Rights in North Dakota. North Dakota i/ˌnɔrθ dəˈkoʊtə/ is the 39th state of the United States, having been admitted to the union on November 2, 1889. It is located in the Upper Midwestern region of the United States, bordered by the Canadian provinces ofSaskatchewan and Manitoba to the north, the states of Minnesota to the east, South Dakota to the south, and Montana to the west. 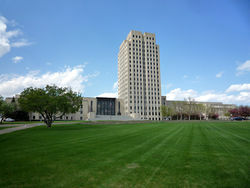 The state capitol is located in Bismarck and the largest city is Fargo. Currently, North Dakota is the 19th most extensive but the 3rd least populous and the 4th least densely populated of the 50 United States. The primary public universities are located in Grand Forks and Fargo. The U.S. Air Force operates air bases near Minot and Grand Forks. North Dakota has weathered the Great Recession with a boom in natural resources, particularly oil extraction from the Bakken formation, which lies beneath the western part of the state. The development has driven strong job and population growth, and low unemployment. North Dakota is located in the U.S. region known as the Great Plains. The state shares the Red River of the North with Minnesota on the east; South Dakota is to the south, Montana is to the west, and the Canadian provinces ofSaskatchewan and Manitoba are north. North Dakota is situated near the middle of North America with a stone marker in Rugby, North Dakota marking the “Geographic Center of the North American Continent”. With an area of 70,762 square miles (183,273 km2), North Dakota is the 19th largest state. The western half of the state consists of the hilly Great Plains, and the northern part of the Badlands to the west of the Missouri River. The state’s high point, White Butte at 3,506 feet (1,069 m), and Theodore Roosevelt National Park are located in the Badlands. The region is abundant in fossil fuels including natural gas, crude oil and lignite coal. The Missouri River forms Lake Sakakawea, the third largest man-made lake in the United States, behind the Garrison Dam. 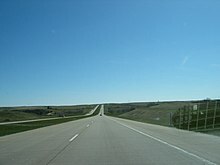 Eastern North Dakota is overall flat, however, there are significant hills and buttes in western North Dakota. Most of the state is covered in grassland; crops cover most of eastern North Dakota but become increasingly sparse in the center and farther west. Natural trees in North Dakota are found usually where there is good drainage such as the ravines and valley near the Pembina Gorge and Killdeer Mountains, the Turtle Mountains, the hills around Devil’s Lake, in the dunes area of McHenry County in central North Dakota, and along the Sheyenne Valley slopes and the Sheyenne delta. This diverse terrain supports nearly 2,000 species of plants. Fort Union Trading Post National Historic Site. Prior to European contact, Native Americans inhabited North Dakota for thousands of years. The first European to reach the area was the French-Canadian trader La Vérendrye, who led an exploration party to Mandanvillages in 1738. Dakota Territory was settled sparsely until the late 19th century, when the railroads entered the region and vigorously marketed the land. An omnibus bill for statehood for North Dakota, South Dakota, Montana, and Washington titled the Enabling Act of 1889 was passed on February 22, 1889 during the administration of Grover Cleveland, but it was left to his successor, Benjamin Harrison, to sign proclamations formally admitting North Dakota and South Dakota to the Union on November 2, 1889. Unrest among wheat farmers, especially among Norwegian immigrants, led to a radical political movement after World War I centered in the Non Partisan League (“NPL”). The NPL, which eventually merged into the Democratic Party, attempted to insulate North Dakota from the power of out-of-state banks and corporations. In addition to founding the state-owned Bank of North Dakota and North Dakota Mill and Elevator (both still in existence), the NPL established a state-owned railroad line (later sold to the Soo Line Railroad). Anti-corporate laws were passed that virtually prohibited a corporation or bank from owning title to land zoned as farmland. These laws, still in force today, after having been upheld by both state and federal courts, make it almost impossible to foreclose on farmland, as even after foreclosure, the property title cannot be held by a bank or mortgage company. The original North Dakota State Capitol burned to the ground on December 28, 1930, and was replaced by a limestone faced art deco skyscraper that still stands today. A round of federal construction projects began in the 1950s, including theGarrison Dam and the Minot and Grand Forks Air Force bases. There was a boom in oil exploration in western North Dakota in the late 1970s and early 1980s, as rising petroleum prices made development profitable. This boom came to an end after petroleum prices declined. From fewer than 2,000 people in 1870, North Dakota’s population grew to near 680,000 by 1930. Growth then slowed, and the population has fluctuated slightly over the past seven decades, hitting a low of 617,761 in the 1970 census, with a total of 642,200 in the 2000 census. The United States Census Bureau, as of July 1, 2008, estimated North Dakota’s population at 641,481, which represents a decrease of 714, or 0.1%, since the last census in 2000. This includes a natural increase since the last census of 20,460 people (that is 67,788 births minus 47,328 deaths) and a decrease due to net migration of 17,787 people out of the state. Immigration from outside the United States resulted in a net increase of 3,323 people, and migration within the country produced a net loss of 21,110 people. Of the residents of North Dakota, 69.8% were born in North Dakota, 27.2% were born in a different state, 0.6% were born in Puerto Rico, U.S. Island areas, or born abroad to American parent(s), and 2.4% were born in another country. The age and gender distributions approximate the national average. Except for Native Americans, the North Dakota population has a lesser percentage of minorities than in the nation as a whole. As of 2011, 20.7% of North Dakota’s population younger than age 1 were minorities. 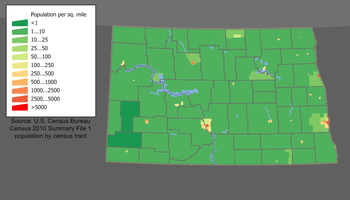 The center of population of North Dakota is located in Wells County, near Sykeston. From the 1930s until the end of the 20th century, North Dakota’s population experienced a gradual decline, interrupted by a couple of brief increases. Young adults with university degrees were particularly likely to leave the state. With the advancing process of mechanization of agricultural practices, subsistence farming proved to be too risky for families, and many people moved to urban areas for jobs. One of the major causes of migration from North Dakota is the lack of skilled jobs for college graduates. Some propose the expansion of economic development programs to create skilled and high-tech jobs, but the effectiveness of such programs has been open to debate. During the first decade of the 21st century, the population increased, in large part because of jobs in the oil industry, related to development of shale-oil fields. 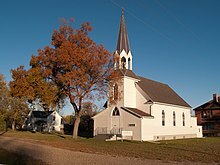 A 2001 survey indicated that 35% of North Dakota’s population was Lutheran, and 30% was Catholic. Other religious groups represented were Methodists (7%), Baptists (6%), the Assemblies of God (3%), and Jehovah’s Witnesses (1%). Christians with unstated or other denominational affiliations, including other Protestants and The Church of Jesus Christ of Latter-day Saints (Mormonism), totaled 3%, bringing the total Christian population to 86%. Other religions, such as Judaism, Islam,Buddhism, and Hinduism, together represented 4% of the population. There were an estimated 920 Muslims and 730 Jews in the state in 2000. Three percent of respondents answered “no religion” on the survey, and 6% declined to answer. North Dakota has a great number of Native Americans, and in fact the word “Dakota” is a corruption of a Sioux word meaning “allies” or “friends”. The primary tribal groups originating in or around North Dakota, consist of the Lakota and the Dakotah (often lumped together as “Sioux”), the Blackfoot, the Cheyenne, the Chippewa, and the Mandan (now extinct). Social gatherings known as “powwows” (or pow-wows) are an important aspect of Native American culture, and occur regularly throughout the State. Throughout Native American history, powwows were held, usually in the spring, to rejoice on the beginning of new life and the end of the winter cold. These events brought Native American tribes together for singing and dancing and allowed them to meet up with old friends and acquaintances, as well as to make new ones. Many powwows also held religious significance for some tribes. Today, powwows are still a part of the Native American culture, and are attended by Native and non-Natives alike. In North Dakota, the United Tribes International Powwow, held each September in Bismarck, is one of the largest powwows in the United States. A pow wow is complete with parades and dancers in regalia, with many dancing styles presented. It is traditional for male dancers to wear regalia decorated with beads, quills and eagle feathers; male grass dancers wear colorful fringe regalia; and male fancy dancers wear brightly colored feathers. Female dancers dance much more subtly than the male dancers. Fancy female dancers wear cloth, beaded moccasins and jewelry, while the jingle dress dancer wears a dress made of metal cones. There are inter-tribal dances throughout the pow wow, where everyone (even spectators) can take part in the dancing. Around 1870 many European immigrants from Norway settled in North Dakota’s northeastern corner, especially near the Red River. Icelanders also arrived from Canada. Pembina housed many Norwegians when it was founded; they worked on family farms. They started Lutheran churches and schools and they greatly outnumbered other denominations in the area. This group has unique foods such as lefse and lutefisk. The continent’s largest Scandinavian event, Norsk Høstfest, is celebrated each September in Minot. The Icelandic State Park in Pembina County and an annual Icelandic festival reflect immigrants from that country. Old world folk customs have persisted for decades, with revival of techniques in weaving, silver crafting, and wood carving. Traditional turf-roof houses are displayed in parks; this style originated in Iceland. A stave church is a landmark in Minot. Ethnic Norwegians constitute nearly one-third or 32.3% of Minot’s total population and 30.8% of North Dakota’s total population. Ethnic Germans who had settled in Russia for several generations grew dissatisfied in the nineteenth century. About 100,000 immigrated to the U.S. by 1900, settling primarily in North Dakota, South Dakota, Kansas and Nebraska. The south-central part of North Dakota became known as “the German-Russian triangle”. By 1910, about 60,000 ethnic Germans from Russia lived in Central North Dakota. They were Lutherans and Roman Catholics who had kept many German customs of the time when their ancestors emigrated to Russia. They were committed to agriculture. Traditional iron cemetery grave markers are a famous art form practiced by ethnic Germans. North Dakotan musicians of many genres include blues guitarist Jonny Lang, country music singer Lynn Anderson, jazz and traditional pop singer and songwriter Peggy Lee, big band leader Lawrence Welk, and pop singer Bobby Vee. The state is also home to two groups of the Indie rockgenre that have become known on a national scale: GodheadSilo (originally from Fargo, but later relocated to Olympia, Washington and became signed to the Kill Rock Stars label) and June Panic (also of Fargo, signed to Secretly Canadian). Ed Schultz is known around the country as the host of progressive talk radio show The Ed Schultz Show, and The Ed Show on MSNBC. Shadoe Stevens hosted American Top 40 from 1988 to 1995. Josh Duhamel is an Emmy Award-winning actor known for his roles in All My Children andLas Vegas. Nicole Linkletter and CariDee English were winning contestants of Cycles 5 and 7, respectively, of America’s Next Top Model. Kellan Lutz has appeared in movies such as Stick It, Accepted, Prom Night, and Twilight. Agriculture is the largest industry in North Dakota, although petroleum, food processing, and technology are also major industries. It is the fastest growing state in USA by GDP.Its growth rate is about 8.3 % The economy of North Dakota had a gross domestic product of $36.8 billion in 2013. The per capita income in 2013 was $50,899, ranked 16th in the nation. The three-year median household income from 2002–2004 was $39,594, ranking 37th in the U.S. North Dakota is also the only state with a state owned bank, the Bank of North Dakota in Bismarck, and a state owned flour mill, the North Dakota Mill and Elevator in Grand Forks. Fargo is home to the second largest campus of Microsoft with 1,700 employees, and Amazon.com employs several hundred in Grand Forks. As of June 2013, the state’s unemployment rate is the lowest in the nation at 3.1% and it has not touched 5 percent since 1987. At end of 2010, the state per capita income was ranked 17th in the nation, the biggest increase of any state in a decade from rank 38th. The reduction in the unemployment rate and growth in per capita income is attributable to the oil boom in the state. Due to a combination of oil related development and investing in technology & service industries, North Dakota has had a budget surplus every year after the 2008 market crash. Historically, North Dakota has always fared well with unemployment. Its highest unemployment rate was 6.8%, recorded in 1983. That is below the current unemployment rate of the majority of states. North Dakota’s earliest industries were fur trading and agriculture. Although less than 10% of the population is employed in the agricultural sector, it remains a major part of the state’s economy, ranking 9th in the nation in the value of crops and 18th in total value of agricultural products sold. The share of people employed in agriculture is comparatively high: As of 2008, only approximately 2-3 percent of the population of the United States is directly employed in agriculture.North Dakota has about 90% of its land area in farms with 27,500,000 acres (111,000 km2) of cropland, the third largest in the nation. Between 2002 and 2007 total cropland increased by about one million acres (4,000 km²), the only state showing an increase. Over the same period, 1,800,000 acres (7,300 km2) were shifted into soybean and corn production, the largest such shift in the United States. North Dakota Mill and Elevator postcard, 1915. The state is the largest producer in the U.S. of many cereal grains including barley (36% of U.S. crop), durum wheat (58%), hard red spring wheat (48%), oats (17%), and combined wheat of all types (15%). It is the second leading producer ofbuckwheat (20%). As of 2007, corn became the state’s largest crop produced, although only 2% of U.S. production. The Corn Belt extends to North Dakota, but is situated more on the edge of the region instead of in its center. Corn yields are high in the southeast part of the state and smaller in other parts of the state. Most of the cereal grains are grown for livestock feed. The state is the leading producer of many oilseeds including 92% of the U.S. canola crop, 94% of flax seed, 53% of sunflower seeds, 18% of safflower seeds, and 62% of mustard seed. Canola is suited to the cold winters and it matures fast. Processing of canola for oil production produces canola meal as a by-product. The by-product is a high-protein animal feed. Soybeans are also an increasingly important crop with 400,000 acres (1,600 km2) additional planted between 2002 and 2007. Soybeans are a major crop in the eastern part of the state and cultivation is common in the southeast part of the state. Soybeans were not grown in North Dakota in the 1940s, but it has become more common in the last 50 years and especially since 1998. In North Dakota soybeans have to mature fast, because of the comparatively short growing season. Soybeans are grown for livestock feed. North Dakota’s economy is aided by nearly $1 billion in federal agricultural subsidies annually. Oil well in western North Dakota. The energy industry is a major contributor to the economy. North Dakota has both coal and oil reserves. Shale gas is also produced. Lignite coal reserves in Western North Dakota are used to generate about 90% of the electricity consumed, and electricity is also exported to nearby states. North Dakota has the second largest lignite coal production in the U.S. However, lignite coal is the lowest grade coal. There are larger and higher grade coal reserves (anthracite,bituminous coal and subbituminous coal) in other U.S. states. Oil was discovered near Tioga in 1951, generating 53 million barrels (8,400,000 m3) of oil a year by 1984. Recoverable oil reserves have jumped dramatically recently. The oil reserves of the Bakken Formation may hold up to 400 billion barrels (6.4×1010 m3) of oil, 25 times larger than the reserves in the Arctic National Wildlife Refuge. However, a report issued in April 2008 by the U.S. Geological Survey estimates that the oil recoverable by current technology in the Bakken formation is two orders of magnitude less, in the range of 3 billion barrels (480×106 m3) to 4.3 billion barrels (680×106 m3), with a mean of 3.65 billion barrels (580×106 m3). North-Western North Dakota is currently in an oil boom: the Williston, Tioga, Stanley and Minot–Burlington communities are experiencing rapid growth. As of 2012, the state is the 2nd largest oil producer in the U.S. with an average of 575,490 barrels per day. The Great Plains region, which includes the state of North Dakota has been referred to as “the Saudi Arabia of wind energy.” Wind energy in North Dakota is also very cost effective because the state has large rural expanses and wind speeds seldom go below 10 mph. North Dakota is considered the least visited state, owing, in part, to its not having a major tourist attraction. Areas popular with visitors include Theodore Roosevelt National Park in the western part of the state. The park often exceeds 475,000 visitors each year. Regular events in the state that attract tourists include Norsk Høstfest in Minot, billed as North America’s largest Scandinavian festival; the Medora Musical; and the North Dakota State Fair. The state also receives visitors from the neighboring province of Manitoba, particularly when the exchange rate is favorable. North Dakota has 52 certified hospitals, 58 rural health clinics, and 84 nursing homes. Major provider networks include Sanford, PrimeCare, Trinity, and Altru. Blue Cross Blue Shield of North Dakota is the largest medical insurer in the state. North Dakota is participating in the 2014 Medicaid expansion, and its health insurance exchange is the federal site, Healthcare.gov. North Dakota is the only US state that legally requires pharmacies to be majority owned by pharmacists, except hospital dispensaries and pre-existing stores. North Dakota’s principal airports are the Hector International Airport (FAR) in Fargo, Grand Forks International Airport (GFK), Bismarck Municipal Airport (BIS), and the Minot International Airport (MOT). The executive branch is headed by the governor. The current governor is Jack Dalrymple, a Republican who took office December 7, 2010 after his predecessor, John Hoeven won his race for U.S. Senate, and resigned to prepare for that office. The currentLieutenant Governor of North Dakota is Drew Wrigley, who is also the President of the Senate. The offices of governor and lieutenant governor have four-year terms, which are next up for election in 2016. The governor has a cabinet consisting of the leaders of various state government agencies, called commissioners. The other elected constitutional offices are secretary of state, attorney general, state auditor, and state treasurer. The North Dakota Legislative Assembly is a bicameral body consisting of the Senate and the House of Representatives. The state has 47 districts. Each district has one senator and two representatives. Both senators and representatives are elected to four-year terms. The state’s legal code is named the North Dakota Century Code. Turtle Mountain Band of Chippewa Indians at Turtle Mountain Reservation. North Dakota’s United States Senators are John Hoeven (R) and Heidi Heitkamp (D-NPL). The state has one at-large congressional district represented by Representative Kevin Cramer (R). On the other hand, Dem-NPL candidates for North Dakota’s federal Senate and House seats have won every election between 1982 and 2008, and the state’s federal delegation was entirely Democratic from 1987 to 2011. North Dakota State Capitol in Bismarck. Fargo is the largest city in North Dakota and is the economic hub for the region. Bismarck, located in south-central North Dakota along the banks of the Missouri River, has been North Dakota’s capital city since 1883, first as capital of theDakota Territory, and then as state capital since 1889. Minot is a city in northern North Dakota and is home of the North Dakota State Fair and Norsk Høstfest. Located a few miles west of Bismarck on the west side of the Missouri River, the city of Mandan was named for the Mandan Indians who inhabited the area at the time of the Lewis and Clark Expedition. New Salem is the site of the world’s largest statue of a holstein cow; the world’s largest statue of a bison is inJamestown. Grand Forks and Devils Lake are located in scenic areas of North Dakota. 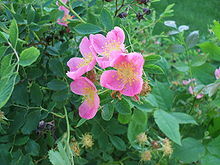 Williston is located near the confluence of the Missouri River and the Yellowstone River near Montana. Medora in the North Dakota Badlands hosts the Medora Musicalevery summer and is the gateway to Theodore Roosevelt National Park. Fort Yates, located along the Missouri River on the Standing Rock Indian Reservation claims to host the final resting place of Hunkpapa Lakota leader Sitting Bull(Mobridge, South Dakota also claims his gravesite). The state has 13 public colleges and universities, five tribal community colleges, and four private schools. The largest institutions are North Dakota State University and the University of North Dakota. “The Flickertail State” is one of North Dakota’s nicknames and is derived from Richardson’s Ground Squirrel (Spermophilus richardsonii), a very common animal in the region. The ground squirrel constantly flicks its tail in a distinctive manner. In 1953, legislation to make the ground squirrel the state emblem was voted down in the state legislature. The state’s oldest radio station, WDAY-AM, was launched on May 23, 1922. North Dakota’s three major radio markets center around Fargo, Bismarck, and Grand Forks, though stations broadcast in every region of the state. Several new stations were built in Williston in the early 2010s. North Dakota has 34 AM and 88 FM radio stations. KFGO-AM in Fargo has the largest audience. Jump up^ “North Dakota Century Code, CHAPTER 54-02-13” (PDF). Retrieved September 13, 2013. ^ Jump up to:a b “Table 1. Annual Estimates of the Population for the United States, Regions, States, and Puerto Rico: April 1, 2010 to July 1, 2013” (CSV). 2013 Population Estimates. United States Census Bureau, Population Division. December 30, 2013. Retrieved January 6, 2014. ^ Jump up to:a b “Elevations and Distances in the United States”. United States Geological Survey. 2001. Retrieved October 24, 2011. ^ Jump up to:a b Elevation adjusted to North American Vertical Datum of 1988. Jump up^ Geography of North Dakota – netstate.com. Retrieved July 21, 2011. ^ Jump up to:a b Shactman, Brian (August 28, 2011). “Unemployed? Go to North Dakota”. CNBC. Retrieved February 7, 2013. ^ Jump up to:a b Fernando, Vincent; Jin, Betty (August 23, 2010). “10 States With Ridiculously Low Unemployment — And Why”. Business Insider. Retrieved February 7, 2013. ^ Jump up to:a b Shaffer, David (December 22, 2012). “N. Dakota population growth is tops in U.S”. Star Tribune. Retrieved February 7, 2013. Jump up^ “Facts and figures”. infoplease.com. Retrieved June 22, 2006. Jump up^ “Land and Water Area of States, 2000”. Information Please. 2006. Retrieved August 17, 2007. Jump up^ “Theodore Roosevelt National Park Virtual Tour”. The Real North Dakota Project. 2007. Retrieved August 17, 2007. Jump up^ “History of Lake Sakakawea State Park”. North Dakota Parks & Recreation Department. 2003. Archived from the original on September 28, 2007. Retrieved August 17, 2007. Jump up^ “A Glacier, A Lake, A Valley and Soil for the Future”. University of Minnesota. 1979. Retrieved August 17, 2007. Jump up^ “North Dakota Facts and Trivia”. 50States.com. 2007. Retrieved August 17, 2007. Jump up^ Shipunov, A. Flora of North Dakota: Checklist. 2012. Jump up^ “Audio Transcript of Pierre Gaultier de La Vérendrye 1738”. The Atlas of Canada. 2003. Retrieved August 19, 2007. Jump up^ “Enabling Act”. Washington State Legislature. Archived from the original on September 19, 2007. Retrieved August 19, 2007. Jump up^ “Coin of the Month”. The United States Mint. Retrieved August 19, 2007. Jump up^ “North Dakota’s Boundaries”. North Dakota Geological Survey. 2002. Retrieved August 19, 2007. Jump up^ “North Dakota State Capitol Building & Grounds Virtual Tour Map”. The Real North Dakota Project. Retrieved August 19, 2007. Jump up^ “North Dakota Timeline”. WorldAtlas.com. Retrieved August 19, 2007. ^ Jump up to:a b “North Dakota History: Overview and Summary”. State Historical Society of North Dakota. 1999. Archived from the original on April 3, 2007. Retrieved August 19, 2007. Jump up^ Perry, Mark (January 31, 2013). “Bakken oil boom in North Dakota might last for 100 years”. American Enterprise Institute. Retrieved February 7, 2013. Jump up^ “North Dakota is Nation’s Fastest-Growing State Since 2011”. U.S. Census Bureau. Retrieved December 21, 2012. Jump up^ “North Dakota Historical Population”. North Dakota State University. Retrieved August 19, 2007. Jump up^ “Annual Estimates of the Resident Population for the United States, Regions, States, and Puerto Rico: April 1, 2000 to July 1, 2008”. United States Census Bureau. Retrieved January 31, 2009. ^ Jump up to:a b c “Cumulative Estimates of the Components of Population Change for the United States, Regions and States: April 1, 2000 to July 1, 2008 (NST-EST2008-04)” (CSV). U.S. Census Bureau. December 15, 2008. Retrieved January 16, 2009. Jump up^ “North Dakota QuickFacts from the US Census Bureau”. Retrieved August 19, 2007. Jump up^ Exner, Rich (June 3, 2012). “Americans under age 1 now mostly minorities, but not in Ohio: Statistical Snapshot”. The Plain Dealer. Jump up^ “statecenters”. U.S. Census Bureau. 2000. Retrieved November 21, 2006. Jump up^ Resident Population Data. “Resident Population Data – 2010 Census”. 2010.census.gov. Retrieved December 14, 2011. Jump up^ “Agenda 2003 – Saving North Dakota”. The Forum of Fargo-Moorhead. 2002. Retrieved August 19, 2007. Jump up^ Oil boom turbocharges North Dakota population growth. The Denver Post. Retrieved on July 12, 2013. Jump up^ “Most Spoken Language in North Dakota in 2010”. Modern Language Association. Retrieved 2013-12-15. Jump up^ “US Census 2000” (PDF). Retrieved September 13, 2013. Jump up^ 2010 Census Data. “2010 Census Data – 2010 Census”. 2010.census.gov. Retrieved December 14, 2011. Jump up^ “North Dakota – Religions”. City-data.com. Retrieved September 13, 2013. Jump up^ “The Association of Religion Data Archives | State Membership Report”. www.thearda.com. Retrieved November 27, 2013. Jump up^ “Germans from Russia Heritage Collection”. Library.ndsu.edu. September 1, 2002. Retrieved September 13, 2013. Jump up^ “Josh Duhamel”. IMDb. 2007. Retrieved August 19, 2007. Jump up^ “Fish Species”. North Dakota Game and Fish Department. 2007. Retrieved August 19, 2007. Jump up^ “Economy of North Dakota”. NetState. June 4, 2007. Retrieved October 4, 2007. Jump up^ “Gross Domestic Product (GDP) by State”. U.S. Bureau of Economic Analysis. October 26, 2006. Retrieved October 4, 2007. Jump up^ “United States and States — R2001. Median Household Income”. U.S. Census Bureau. Archived from the original on September 14, 2007. Retrieved October 4, 2007. Jump up^ “Amazon to Expand Customer Service Center in Grand Forks, ND”. Bloomberg. Retrieved December 21, 2012. Jump up^ Gunderson, Dan. “With Microsoft, Hitachi to open software business in Fargo”. Minnesota Public Radio. Retrieved December 21, 2012. Jump up^ Cauchon, Dennis (March 17, 2011). “North Dakota economy booms, population soars”. USA Today. Jump up^ Canova, Timothy. “The Public Option: The Case for Parallel Public Banking Institutions”. Retrieved January 31, 2013. Jump up^ “Current Unemployment Rates for States and Historical Highs/Lows”. Bls.gov. August 19, 2013. Retrieved September 13, 2013. Jump up^ “North Dakota — DP-3. Profile of Selected Economic Characteristics: 2000”. U.S. Census Bureau. Retrieved August 30, 2007. Jump up^ “Extension”. Csrees.usda.gov. April 19, 2011. Retrieved October 23, 2012. Jump up^ “NASS – Publications – Trends in U.S. Agriculture”. Nass.usda.gov. December 5, 2005. Retrieved October 23, 2012. Jump up^ State Renewable Fuels Profile. U.S. Energy Information Administration.. Retrieved February 5, 2011. Jump up^ Coal General Statistics, National Mining Association.Retrieved February 5, 2011. Jump up^ “Things To Do In North Dakota”. ThingsToDo.com. Retrieved October 4, 2007. Jump up^ Gunderson, Dan (August 28, 2006). “North Dakota oil patch is booming”. Minnesota Public Radio. Retrieved October 4, 2007. Jump up^ Donovan, Lauren (June 20, 2006). “North Dakota may be bigger oil player than Alaska”. Bismarck Tribune. Jump up^ “3 to 4.3 Billion Barrels of Technically Recoverable Oil Assessed in North Dakota and Montana’s Bakken Formation—25 Times More Than 1995 Estimate”. U.S. Geological Survey. April 10, 2008. Retrieved April 11, 2008. Jump up^ North Dakota Drilling & Production Statistics. Retrieved February 5, 2011. Jump up^ Crude Oil Production. U.S. Energy Information Administration.Retrieved February 5, 2011. Jump up^ “Earth Policy Reader”. Retrieved February 25, 2009. Jump up^ Lukas, Paul (November 1, 1999). “State Secret North Dakota, our least visited state, is also among the most underappreciated”.CNNMoney.com. Retrieved July 13, 2010. Jump up^ “First Annual Centennial Strategy for Theodore Roosevelt National Park]” (PDF). August 2007. Retrieved July 13, 2010. Jump up^ “Norsk Høstfest”. October 7, 2006. Retrieved 2010-07-013. Jump up^ Health Resources. Ndhealth.gov. Retrieved on July 12, 2013. Jump up^ ND governor signs Medicaid expansion bill | Minnesota Public Radio News. Minnesota.publicradio.org (April 16, 2013). Retrieved on July 12, 2013. Jump up^ “Dakota, Missouri Valleya and Western Railroad”. Dakota, Missouri Valleya and Western Railroad. Retrieved October 5, 2007. Jump up^ “About Us”. Red River Valley and Western Railroad. Retrieved October 5, 2007. Jump up^ “Amtrak — Routes — Northwest”. Amtrak. Retrieved October 5, 2007. Jump up^ Transit / Data Maps. NDSU SURTC. Retrieved on July 12, 2013. Jump up^ “State Government”. State of North Dakota. Retrieved October 6, 2007. Jump up^ “District Courts”. North Dakota Supreme Court. Retrieved October 6, 2007. Jump up^ “All District Judges”. North Dakota Supreme Court. Retrieved October 6, 2007. Jump up^ “North Dakota Judicial System”. North Dakota Supreme Court. Retrieved October 6, 2007. Jump up^ “FAQ: Individual Income Tax”. Office of State Tax Commissioner, Tax Department, North Dakota. Retrieved October 4, 2007. Jump up^ “States Ranked by Total State Taxes and Per Capita Amount: 2005”. U.S. Census Bureau. Retrieved October 4, 2007. Jump up^ “Sales and Use”. Office of State Tax Commissioner, Tax Department, North Dakota. Retrieved October 4, 2007. Jump up^ “Grand Forks: Economy — Major Industries and Commercial Activity”. City-Data.com. Retrieved October 4, 2007. Jump up^ “Property”. Office of State Tax Commissioner, Tax Department, North Dakota. Retrieved October 4, 2007. ^ Jump up to:a b “Tax Research Areas > North Dakota”. The Tax Foundation. Retrieved December 14, 2011. Jump up^ “Official Portal for North Dakota State Government”. nd.gov. June 16, 1957. Retrieved December 14, 2011. Jump up^ “License Plates of North Dakota (United States)”. Worldlicenceplates.com. Retrieved December 14, 2011. Jump up^ S. D. Senate Bill No. 134. Jump up^ “First Stations in Each State”. National Radio Club. Retrieved October 6, 2007. Jump up^ AM Query Results – Audio Division (FCC) USA. Transition.fcc.gov. Retrieved on July 12, 2013. Jump up^ FM Query Results – Audio Division (FCC) USA. Transition.fcc.gov. Retrieved on July 12, 2013. Jump up^ Radio Online ®. Ratings.radio-online.com (June 8, 2013). Retrieved on July 12, 2013. Jump up^ “North Dakota’s First Television Station”. Prairie Public. Archived from the original on October 23, 2007. Retrieved October 6, 2007.